How many regions make up the former Yugoslavia? It’s a good pub quiz question, don’t you think, but I’m never quite sure of the correct answer. Depending on how the question is worded (notice I used the word regions rather than countries), your response could be six, seven or even eight and they would all be correct. Sort of. Officially, there are six recognised countries in the former Yugoslavia: Serbia, Croatia, Bosnia and Herzegovina, Montenegro, Slovenia and Macedonia but on top of this there are also two autonomous territories, Kosovo and Vojvodina, both of which are officially in Serbia. Apart from knowing that Novi Sad, the second largest city in Serbia, is its administrative capital, I know very little else about Vojvodina. But, prior to visiting, and like many others I’m sure, I always assumed that Kosovo was a country in its own right (a bit like Taiwan) and so my answer to the above question, regardless of how it is worded, would be seven. Indeed, Kosovo is recognised by 108 UN members, so I probably wouldn’t be alone in assuming this was the correct answer. We’ve travelled quite extensively in all of the above countries/autonomous states except for Vojvodina. We like the region very much. 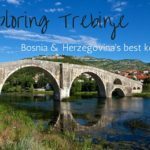 There is a wealth of things to see and do, the scenery (particularly in Bosnia and Herzegovina and along Croatia’s coast) is wonderful and away from tourist hotspots such as Dubrovnik and Ljubljana, it is very good value for money. What’s more, the region is also very safe and peaceful, an observation that is really quite remarkable when you think about its recent history. The war in the Balkans, which lasted from 1991 to 2001, was, without doubt, the most destructive conflict on European soil since World War II. The level of ethnic and religious hatred was without parallel and had not been witnessed since the Nazis’ systematic attempts to annihilate the Jewish race during the course of the 1930s and the first half of the 1940s. There are still reminders, of course, that the war took place; museums, monuments, mass cemeteries and even war-torn buildings can be found in many towns and cities throughout the former Yugoslavia. 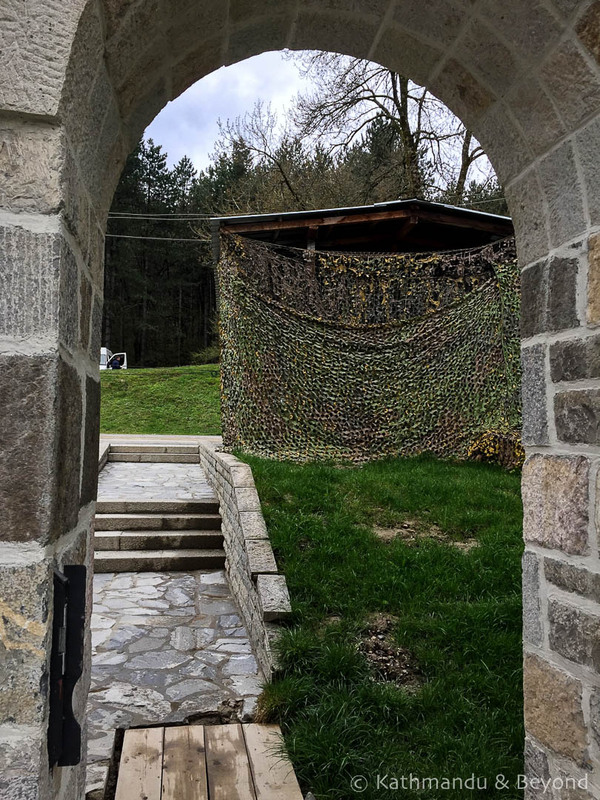 These days they are predominately memorials or symbols of the region’s recent tragic past, but there is a monastery in Kosovo that goes beyond simply being synonymous with the conflict and hints at the fact that the ethnic and religious tension that started the war in the first place hasn’t disappeared completely. Situated on the road between Prizren and Pec in the west of the country, Visoki Decani Monastery is one of the most controversial places of worship in the Balkans. Although Kosovo doesn’t officially have a religion, the majority of the population consider themselves to be Muslim, yet the monastery is part of the Serbian Orthodox Church and home to/managed by monks from the Eparchy (region) of Raska and Prizren, one of the most ancient dioceses in the Serbian Orthodox Church. 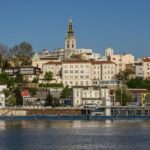 This, coupled with the fact that Serbia refuses to recognise Kosovo as anything more than an autonomous territory within its own boundaries, means there has been, and still is, religious and ethnic unease surrounding the monastery’s location and purpose. (*) Because the region is still considered to be politically unstable, all four buildings are also on UNESCO’s World Heritage in Danger list. Furthermore, currently UNESCO does not accept Kosovo as a member state and the Medieval Monuments in Kosovo are listed under Serbia on their website. Although all four monuments are considered controversial, Visoki Decani is the most contentious and over the years, it has been attacked, damaged and looted. During the Kosovo War (February 1998 until June 1999), the monks at Visoki Decani sheltered refugees from all ethnic backgrounds, while during the 2004 unrest in Kosovo (in which thousands of Kosovo Albanians went on the rampage and attacked the minority Kosovo Serbs), the monastery had to be defended by the NATO-led Kosovo Force (KFOR) against an unruly mob who threw homemade petrol bombs at the building and its occupants. 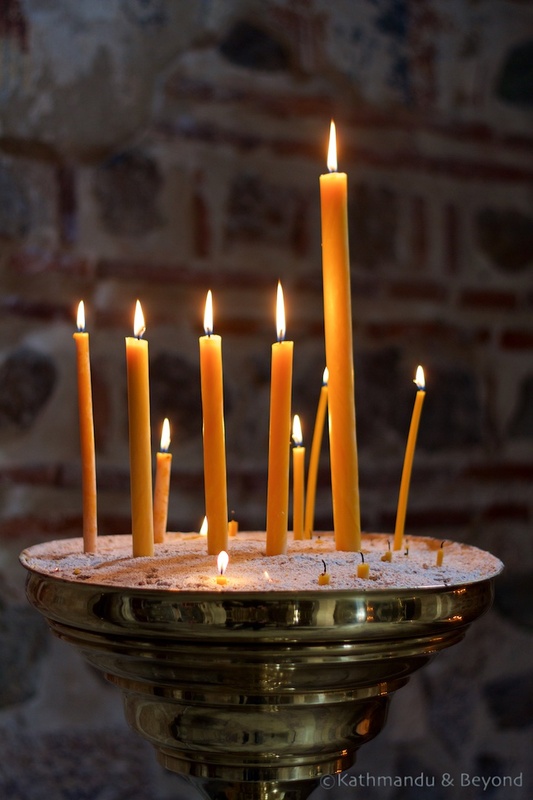 The last reported incident involving the monastery was in 2007 (a hand grenade attack by Kosovo Albanian insurgents in which little damage was done) but since then, the situation has improved and remains relatively calm. 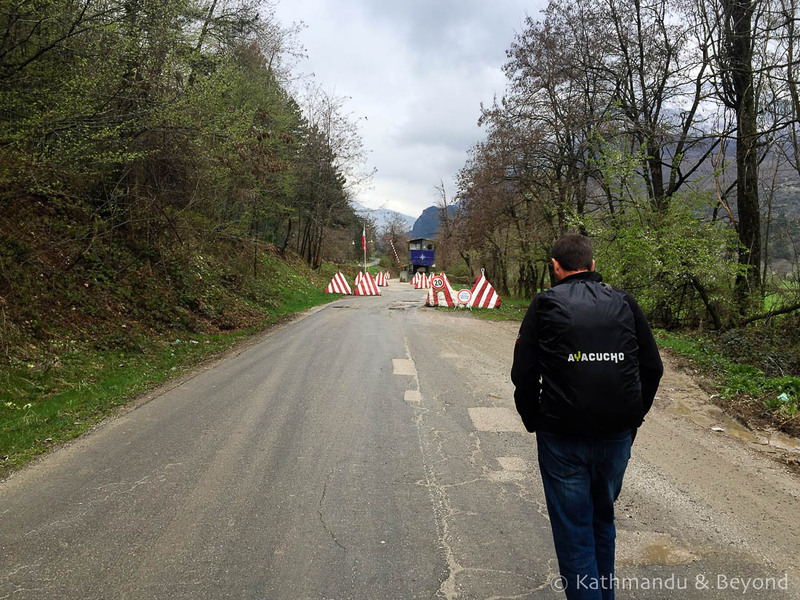 The monastery is still guarded by KFOR however, and when we visited in April 2015, we had to pass through two checkpoints and leave our passports with the guards on the main entrance before we were permitted to enter. 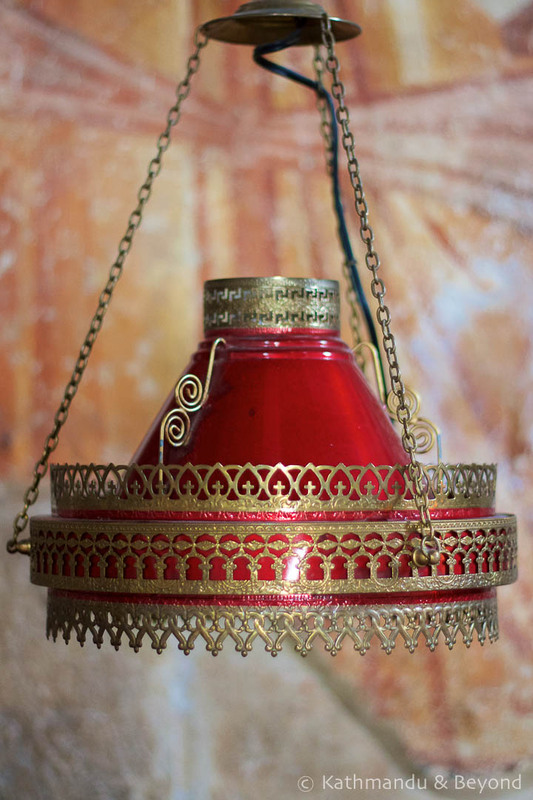 Why visit Visoki Decani Monastery? Undoubtedly, the main reason to visit the monastery is to see the wonderful frescos and icons in the church’s interior. Officially, you are not permitted to take photos inside the building, but the monks seemed pretty relaxed about this and when we saw other visitors using their cameras and phones without reprimand, we decided to take some photos ourselves. Away from the interior, the monastery grounds exude a relaxed atmosphere and there is a small shop where you can buy wine, cheese and honey, all of which are produced on site by the monks themselves. We visited on a particularly damp and miserable day but had it been clear and sunny the countryside surrounding the monastery would have been especially picturesque and tempting for an hours’ walk or so. Visoki Decani Monastery is 16km south of Pec, 60km north-west of Prizren and 84km west of Pristina. Having your own transport is unquestionably the most convenient way to get to the monastery but it is certainly doable by public transport combined with a little bit of walking. Pec (which is a nice town to visit regardless) is the easiest base for getting to the monastery. From Pec, frequent buses make the 30-minute journey to the town of Decani. Additionally, there are buses that travel from Prizren to Pec that pass through the centre of Decani along their route. 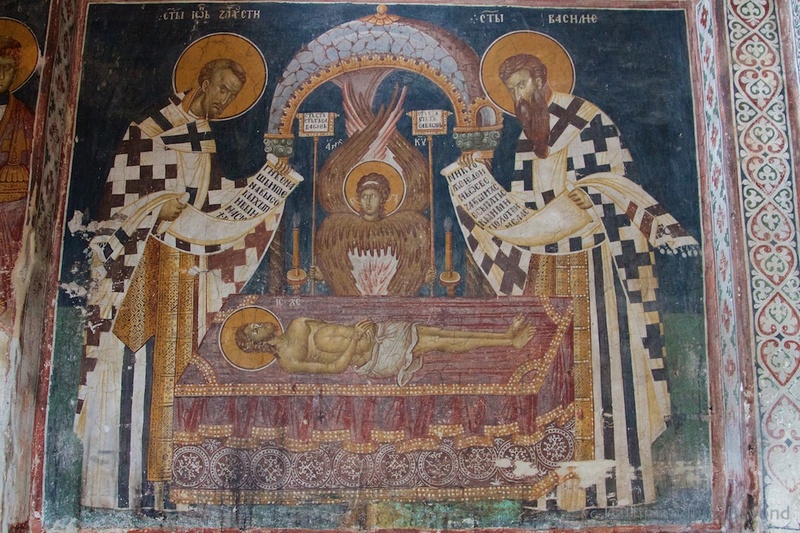 This means it is feasible to visit the monastery en route between Prizren and Pec or even between Prizren and Pristina. We did the latter, but the handful of direct buses between Prizren and Pec didn’t begin to depart until the afternoon, which was not overly convenient. We therefore took a morning bus to Gjakove, which is about halfway between Prizren and Pec, and another bus from there to Decani. There was a little hanging around in Gjakove for the onward bus (it didn’t help that we did the journey on a Sunday when there was limited service) but it basically worked out fine. Up to date timetables are posted at Prizren’s bus station. To then get to Pristina after visiting the monastery, we made the short journey to Pec and connected with one of the very frequent buses to the capital (which depart every twenty minutes or so). Whatever bus you arrive on, ask to be dropped off at the main roundabout in the centre of Decani. In order to reach the monastery, take the second exit (if coming from Pec) and walk straight for 2km. After about 600m, the road narrows and leads through the forest to the monastery itself. There are two checkpoints along the way. The first is about 1km out and we weren’t stopped at this one. The second is at the monastery gate. Here we had to submit our passports and complete the registration book. The two Swiss KFOR soldiers on the gate were friendly and we had a little chat with them before entering. They also allowed us to keep our rucksacks in their guardhouse while we visited inside. After visiting the monastery, we returned to the same spot in the centre of Decani in order to flag down onward transport. The monastery is open from 10.30am to 2pm and then 3.30pm to 5.30pm Monday to Saturday and 10am to 6pm on Sunday. There is no entrance fee to enter the monastery. Donations are always welcome. Remember to take your passport when visiting the monastery. You won’t be allowed in if you don’t have it on you. 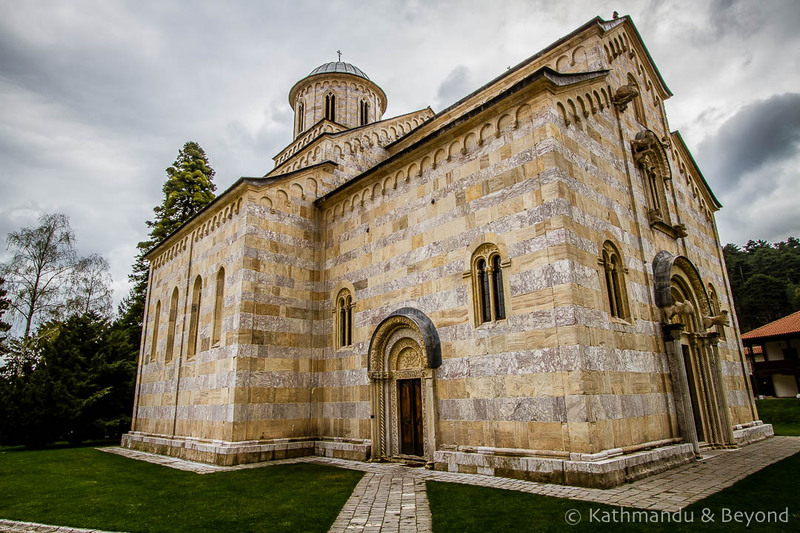 Is it worth visiting Visoki Decani Monastery? The answer to this question depends on the amount of time you have in Kosovo in general. 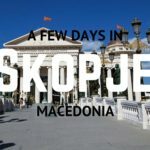 Prizren is most definitely the highlight of the country, more so than Pristina, but if you are travelling between the two and want either to break the journey or go on a bit of an adventure then travelling via Visoki Decani Monastery in the manner described above is an interesting way of doing it. 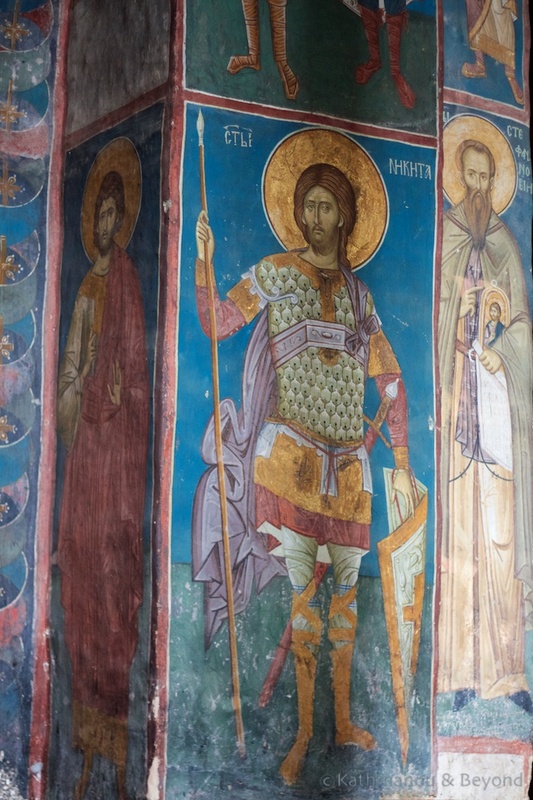 If you simply want to visit one of the four UNESCO-listed Medieval Monuments in Kosovo, two of the other three are easier to reach without your own transport than Visoki Decani. 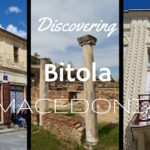 Gracanica Monastery is a simple bus ride from Pristina and the Monastery of the Patriarchate is just a 15-minute walk from Pec’s main square. Visiting Our Lady of Ljevis Church in Prizren, which was heavily damaged by arson during the 2004 unrest, is hit and miss. The church is almost always locked and heavily guarded. First, enquire at St George’s Church on the other side of the river if you want to visit inside. In summary, if you’ve got time and/or your own transport, Visoki Decani is worth visiting. If your time is limited focus on seeing Prizren, followed by Pristina. One final thought. 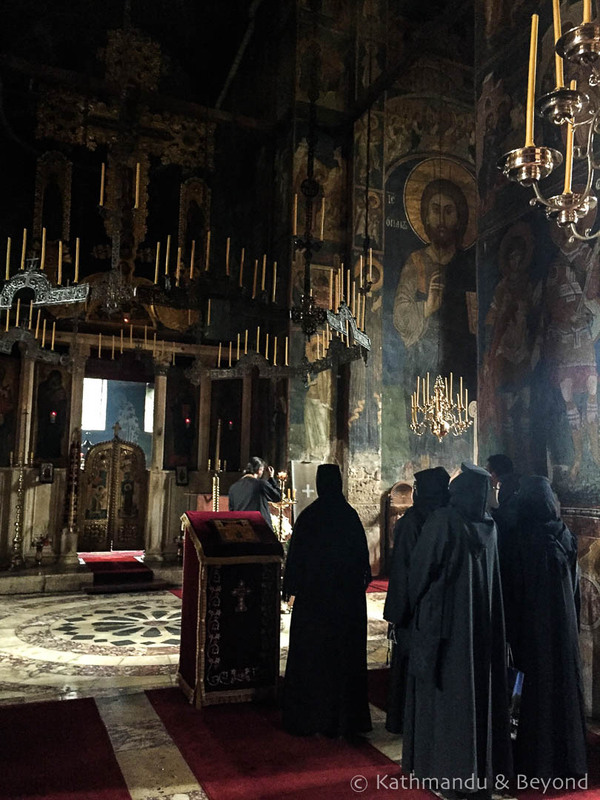 We didn’t sense any tension when we visited Visoki Decani Monastery. The monastery itself was incredibly tranquil and the monks kept to themselves. In the town, we got talking to a couple of local guys while waiting for our onward bus and told them where we had been. They didn’t comment and simply invited us to join them for coffee while we were waiting for our bus. Interesting and informative read. 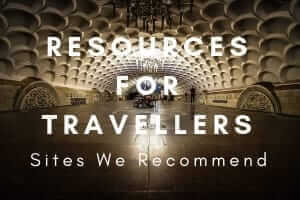 Good to hear you can visit relatively easily via public transport. I’m visiting Kosovo soon and will try to include this on my trip. Thank you Martin and it’s well worth making the effort to visit Decani Monastery. Also, the nearby Patriarchate of Pec Monastery is also worth visiting. It’s about a 20 minute walk from the centre of town. Thanks Mark, will try to visit both. Definitely something special about these historic monasteries.